No-Rush Mapset - a pftq co-production! These are standard ES maps with the addition of an invisible wall in the center. The wall blocks both ships and land units, dividing the two teams or players. In addition, all enemies will be set neutral to each other and fighting is therefore impossible. When the timer ends (the number displayed in the map name), the invisible wall will be removed and diplomacies reset, allowing fighting and regular gameplay. These maps basically provide perfect No-Rush gameplay. Eventually all maps will be added, but it takes time. Each newly finished map will be released as soon as possible. Enjoy the currently released NR maps (found on the Downloads page) in the meantime! 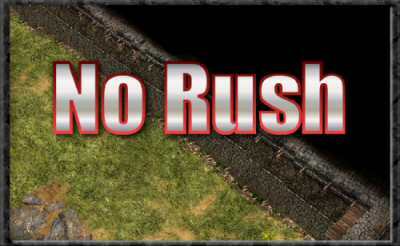 Furby_killer originally created maps to enforce No-Rush games by building a wall - a real, solid wall. This brought on many problems. For one, they didn't always place correctly or there were small gaps. Second, ranged units could still attack throughthe wall. Third, to make room for the wall, the map was modified ever so slightly - therefore not creating a real No-Rush duplicate of the original maps. It was great, but it wasn't perfect. Having build several walls without flaw before in previous Fort Wars test versions, pftq brought to his attention a method to do this perfectly without flaw. There were also invisible structures that could be used and diplomacy could be set to end all attacking for a period of time. This did not require changing of the original map layouts. The invisible wall was simply put over and through anything that got in its way, creating a true No-Rush duplicate. After several days and tests, a perfect NR version of Yukon was created. It was ready to be played, and other maps to be made were not to be too much more difficult as the code was now available to copy to other maps (with some adjusting to the new maps of course).